Iced teas are so easy to make at home that you would forget buying those hideous packets of crystalline sugar and tea concentrate. In the last one decade we have noticed that the flavoured soft drink concentrates have new competition by the flavored tea concentrates. Both these are loaded with sugar and artificial colours and flavours. Trust me even the Iced teas served in hotels and restaurants are all synthetically flavoured. How else they would serve Peach iced tea when peaches are not in season and Mango iced tea is the biggest sham. Please try and look into the ingredients whenever you order Iced teas at a restaurant, however swanky, ask if they can make ginger or fresh lime iced tea and order only after inquiring about the ingredients. Having worked in a few commercial establishments I am an insider telling you how the costing issues makes them compromise on real flavours and how demands for fruits and produce 'not in season' pushes them to use synthetic flavours. In a way, indirectly we as consumers decide what we get on our table always. So if you order something in season, something available locally you get the real thing. If you want cheap blueberry iced tea you never get the real deal. I would assure you that I always insist on using real ingredients wherever I work as consultant and there are people who believe in real food. Ordering Iced teas carefully at restaurants is good, being aware helps and please know that any kind of Iced tea that comes in crystalline form in a plastic packet, ready to be dissolved with water cannot be real. My question is, why we are even drinking them blindly when we can make our own real iced teas at home? India is a country where we take great efforts to make our milky chai and milky filter kapi (coffee) and serve these hot beverages proudly to all and sundry. Iced tea is way more easier than the milky chai and kaapi and we depend upon packets of iced tea? Not fair. To our advantage all Indian kitchens are well stocked with spices and green fresh herbs most of the times. Some of the spices and most of the herbs make great combinations with some read brewed green tea or any good tea that you like. My current favourite is Assam Golden tips from Mittal teas. 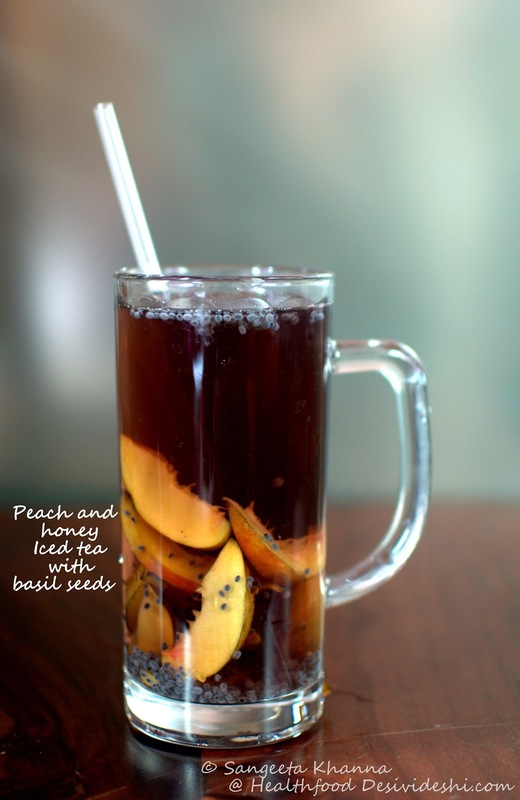 This peaches and basil seeds iced tea has been a favourite since long. 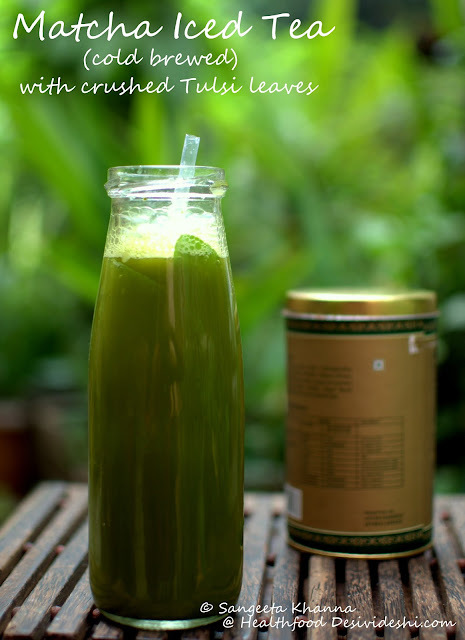 Check out the recipe here..
Take a large jug or kettle and tip in your favourite green tea or black tea leaves. Add some spice that you like, and a fresh herbs that you think you would like or some fresh fruit slices or a combination f all these to the kettle. Heat water to 90-95 C, just when the water starts emitting bubbles, and pour it over the spices and herbs and loose tea in the jug or kettle. Cool down the tea while it brews. Refrigerate to get it as chilled as you want. Add ice cubes if you want or have the iced tea chilled to your liking. Some basil seeds in the Iced teas make then more attractive apart from adding some health benefits too. 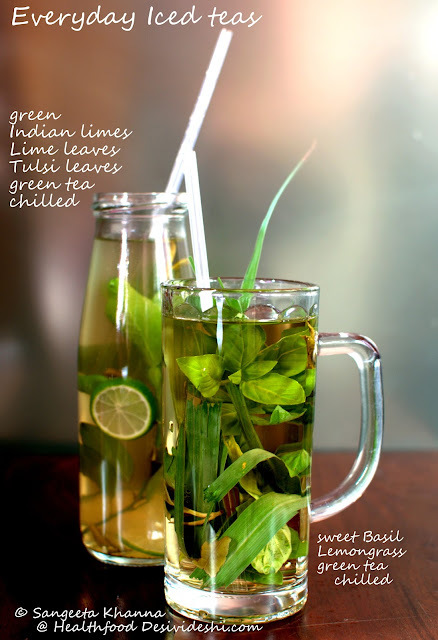 Tulsi can be easily added to any tea when cold or warm, just bruit the leaves to infuse the flavours well. 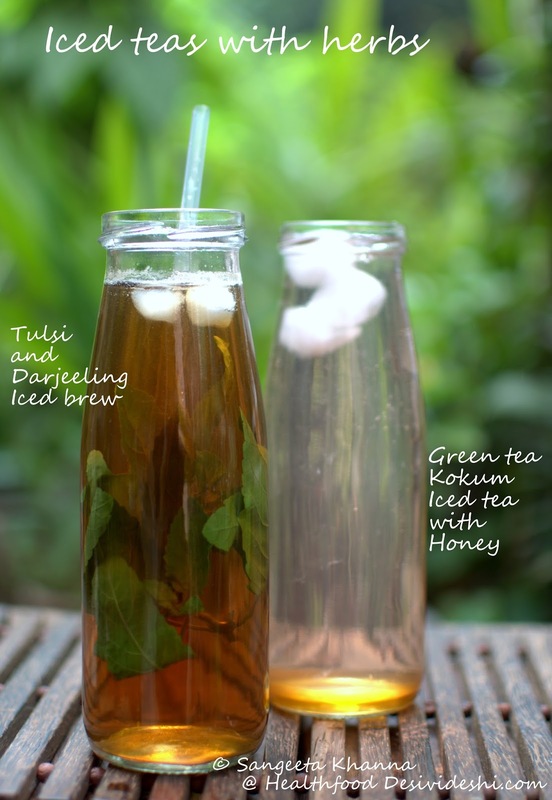 The Kokum and honey Iced tea with green tea brew is something that we often take with a hint of coconut milk too. Here in the picture it is just plain kokum brewed along with green tea and chilled, served with a drizzle of honey. When carrying iced tea for office you can keep them in the office refrigerator or just freeze the bottles overnight and carry them so they thaw and stay chilled after a few hours. 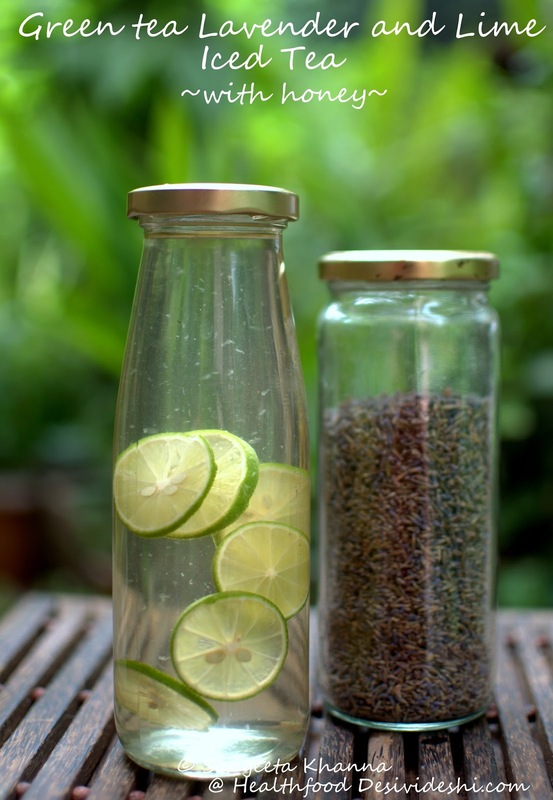 This Lavender and lime iced tea is so refreshing and exotic you would forget all fancy looking iced teas you order and carry this one to your long drives and even for office time beverages. This Matcha cold brew with bruised fresh Tulsi leaves is another favourite with a drizzle of honey. To make this match and tulsi iced tea, just make a slurry of matcha powder with cold water and pour over ice cubes, fill with chilled water and add some bruised fresh Tulsi leaves. Add honey to taste and enjoy as you wish. 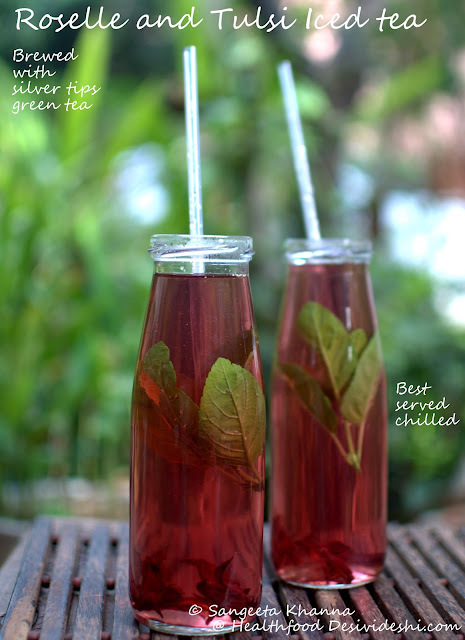 And our current favourite at home is this Roselle and fresh Tulsi Iced tea with silver tip green tea, chilled in the fridge and not with ice cubes as it dilutes the flavours. This is one flavour you wont like diluting. Roselle is from an organic farm Aiyor Bai, run by a dear friend Madhu Reddy. Tulsi is growing abundantly in my own garden this season. 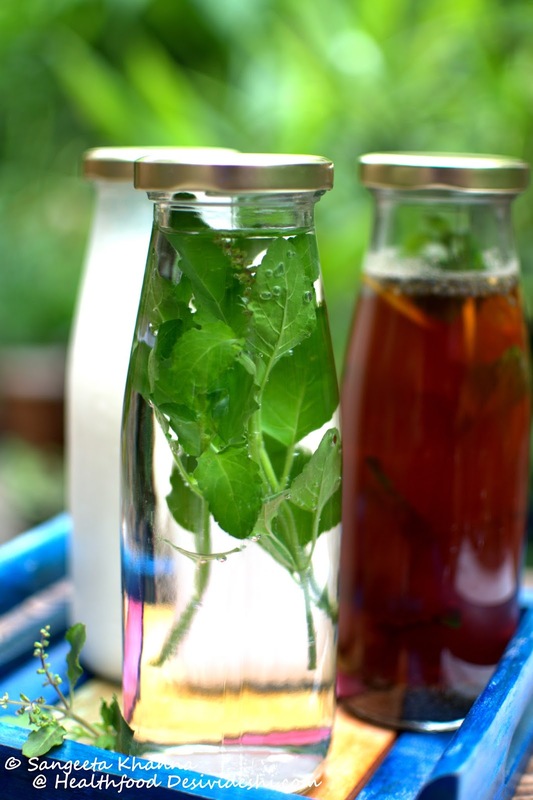 You can always grow some herbs easily in your balcony or terrace garden and use the herbs for making iced teas. For an intense lime and tulsi iced tea I use my limes (nimbu) a lot. 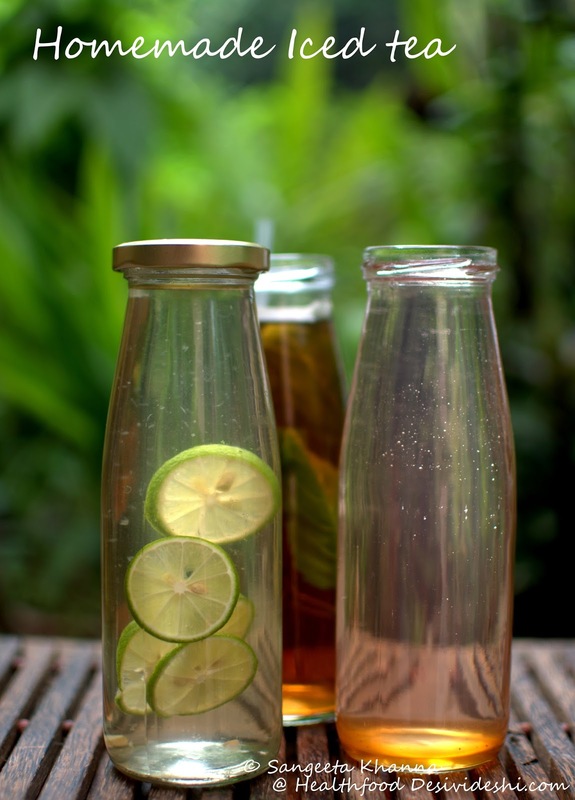 The iced tea below is made with a green tea brew with crushed lime leaves (nimbu ke patte), some crushed Tulsi leaves and fresh lime slices. 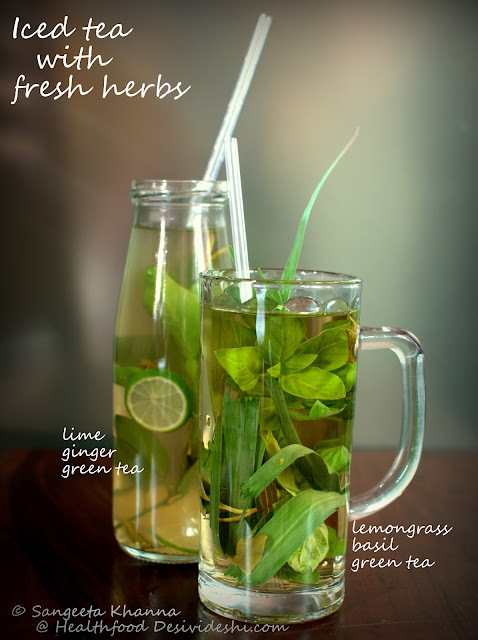 Another Lemongrass and Basil iced tea is made using a green tea brew, lemongrass infusion (made with boiling lemongrass leaves for 5 minutes) and freshly crushed sweet basil leaves. I have been posting ideas about lunch boxes for adults and when I posted the picture of bottles of iced tea, infused water and buttermilk last week on my facebook page, many of my friends and readers asked where do I get those bottles and what other containers will be suitable for carrying beverages. A few friends even called and told me they have started carrying buttermilk and iced tea to office after reading about them in the last post. If not iced teas, you can just infuse drinking water with tulsi, basil, mint or limes or ginger, turmeric, fenugreek seeds etc. I know the websites and blogs are full of attractive pictures of fruit or cucumber infused detox water but you must know this is just a fad. The fruit infused water just makes the drinking water more desirable, so you drink some more water and that is definitely cleansing. But if you want health benefits from this water it is better to infuse the drinking water with herbs that your body needs. Simple common sense things that work wonders for changing habits. If you have been ordering Iced teas or soft drinks from your office canteen please get some bottles and start carrying your own real beverages. I am putting up a couple of these bottles as a lucky give away for the lunch box series too. Share your ideas about lunch boxes in general, or iced teas that you would like to carry to your office in the comment section below and get a chance to win two of these bottles. But brew some good tea, have it hot, warm, chilled or iced and relax. A good tea is a thing to cherish. Hi Sangeeta! Much thanks for introducing your readers to this lovely and refreshing post about iced teas! Being a teaholic myself I am looking forward to brewing these delicacies for me and my family. You are correct when you say that the ones available in shops and restaurants are loaded with sugar and artificial colours! Yes, the bottles are oh-so-nice and make the experience of drinking all the fun! I also want to take this opportunity to thank you for dedicating an entire section on gluten-free breakfast ideas/recipes. I have been following them and trying to incorporate the alternative flours in my cooking, ever since I found out about my gluten-allergy. Truth be told, every time I googled for gluten-free recipes, most of the results came up with western ingredients and none were as innovative and relevant as yours. So, thank you nonce again for those recipes. I also enjoyed the posts on lunch box ideas! Please keep coming up with more of such healthy and interesting and doable recipes; keep inspiring novices like me to turn cooking into an enjoyable and healthy acitivity! As for lunchbox ideas, I love to go for upma, poha, phodni cha bhaat( seasoned rice, usually leftover from the night). One ca nadd veggies to make these more flavorful and healthy. Bhakhris are a favorite too. I used to take them in lunchbox. Though I didnt know how to keep them from getting hard. Then I started mixing a little bit of boiled potato to the dough. It made them softer yet crisp. I also liked soya nuggest and soya keema as filling or bhurji with parathas or chapati. Soya chunks (Ruchi's) I used with rice too. Dry urad dal and dry chana dal, matar ki gughri, all kinds of usal ( moth, masoor, moong, kulth) taste awesome. Similarly the sprout salads. cheelas of all sorts with fresh chutneys. Mom used to make curd rice by setting the curd with cooked rice in it. seasoned with curry leaves etc. Appams and pachadis were my favorites but that was long ago. They reheat so well. even idlis and vadas. Sabudana khichadi.. yum. batata vada, pao bhaji (home cooked), pastas, quesadillias (tortillas) with so many filling choices. cooked beans (rajma esp) over whole wheat pasta or rice noodles. I made it some months back. corn chaat or any other chaat. One thing I loved taking was mudi (rice puffs) or bhel. Not mixed but in separate containers an mixed on the spot. Made tamarind ,dates chutney at home. Used it in all sorts of chaat and with snacks. zunka bhakar was also a fav. zunka made from spring onions, cabbage, green capsicum, even corriander. Mom was always in rush for work so sometimes she gave us roti upma too made from leftover rotis. The idea was to keep in mind , season and duration for which the lunch will remain packed. It shouldnt get spoiled due to weather or time. No even I want to write about lunchboxes :p A nostalgia post. Can you please suggest good brands of green tea? I have stopped putting sugar in to my tea and the usual chai is not working for me. I would like to switch to green tea. Your recommendation s would be helpful. Thanks much! I like to add sabja seeds in my iced tea...lovely taste and feeling! Thanks Aishwarya :-) Some of the teas are really really expensive but we can be innovative and infuse our own flavours.